After satisfying my early morning Maslow’s basic survival needs with a long black coffee, wholemeal toast with lashings of vegemite, a petite bowl of muesli, I then mentally consumed the words in my newspaper looking for that insightful and learned spark of wisdom. Five minutes later, possibly six at a stretch, I had quickly come to the conclusion that I was bored. There was now only one thing for me to do in order to fill-in the time before I boarded my flight to Sydney, and that was to observe my fellow business travelers. After a few minutes of visual critique, it became very apparent that the long sought personal goal of individual creativity which defined everyone as a unique individual, had somehow slipped between the cracks that morning. The more I looked, the more I could see many of my yet unknown business acquaintances partaking of coffee, cereal, toast with the occasional variant of a random accompaniment of difference (eg marmalade or honey), but in essence the selected diet was remarkably the same. We wore similar suits, ties, cuff-links, shirts with that all too familiar checked pattern and colour, read the same newspapers, and even looked at each other with that same inquisitive look when a wild animal is startled from its habitual and comfortable lifestyle by an oncoming car headlight. This got me thinking. How can we be creative if we are all seeking business innovation and inspiration via the same sources of knowledge and thought? The well-known term “thinking outside the box” came to mind, but is this the right way to discover new ideas? If we are all following the same methodology, all reading the same editions of the Harvard Business Review, the same business books, following the same sports, eating the same food, well, our sight outside the box is rather flawed and certainly lacks that required long distance vision, it will also be the same view as everyone else! Why not try something a little bit different? Why not “think inside the box”, but with a major difference, that being time as a variant? 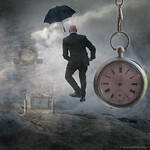 There is a lot of untapped idea history “inside the time box”, the key is to open it up and use it. Many potentially brilliant ideas have literally died with creative thinkers of past generations. If their ideas had been passed down between the ages, their insights may have formed the basis of many unusual and different innovations that could only be fulfilled with the progression of time and today’s technology. Dress up in period costume and wear those antiquated spiffy clothes in the corporate office? Don’t read today’s newspaper, read some old papers and get an appreciation of the business and life customs of the past? Don’t drive to work, walk or take your personal horse and buggy? I’m sure the experience would lead to some different and creative thoughts being established as you think” inside the time box”. Your business colleagues will also have the benefit of thinking differently as they observe you in the process of historical thought change and will marvel at your self-confidence and creative fortitude. So next time you are sitting in the Virgin Lounge at Melbourne airport awaiting your flight, try and consider what you can do to implement some small amount of thinking “inside the time box”, I’m sure it will lead to a noticeable creative point of difference in your life. If the concept is too great to publicly display, then why not start off with a lesser innovative step, don’t have a long black coffee, have a soy milk chai latte with honey instead!